This month, the women's organization of my church celebrated it's 170th birthday. We had a humanitarian night and birthday cake for dessert. This was a golden vanilla cake with vanilla buttercream icing. I used a fun method involving a paper towel to make the buttercream look smooth like fondant. I'll have to try and do a tutorial sometime. I'm still learning, but liked the way it turned out. 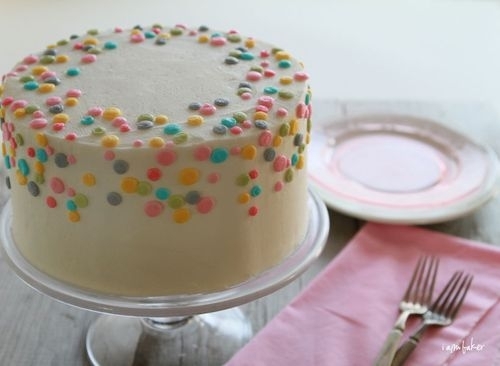 I added colorful dots on the top and sides using my cake decorating tips. I flattened the imperfections down by using my finger dipped in powdered sugar, worked great. The inspiration cake, found HERE at i am baker. And, just so you know... when I bake and decorate a cake, the house explodes. Dishes are never done. Dirty laundry overflows. Toys are everywhere. Just keepin' it real, people. I printed off the previous picture as a reference as I dotted my cake. If you are celebrating 170 years, you should make it known. The cake is beautiful, hope you all had a great time.